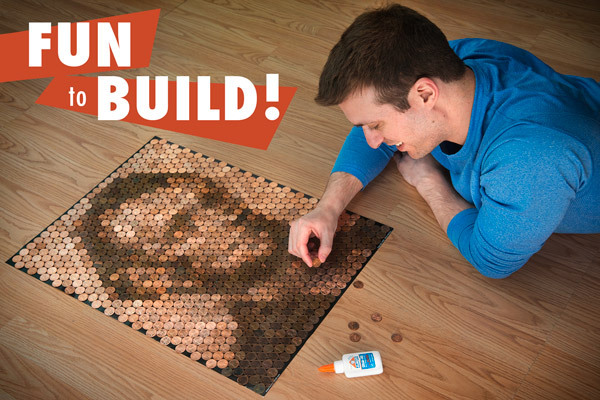 Honor the 16th U.S. President with a portrait of Honest Abe himself made entirely from one cent coins. A portrait of Lincoln made from portraits of Lincoln! The Lincoln Penny Portrait is a unique celebration of the 16th President of the United States. It uses 846 pennies, all featuring the likeness of Abraham Lincoln, to create a much larger and much more interesting likeness of The Rail Splitter. 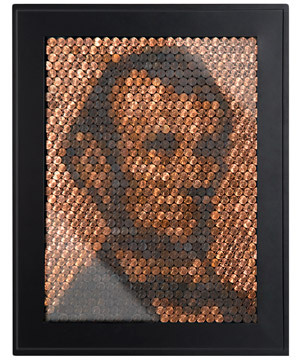 Create this stunning portrait of Lincoln using only four shades of pennies! The creators of the Lincoln Penny Portrait painstakingly designed its poster template using historical photographs and endless tinkering of the design, penny arrangement, and number of shades. The final design requires separating your pennies into only four shades, yet produces an instantly recognizable image. The included poster is an easy-to-follow template that ensures an appealing result. 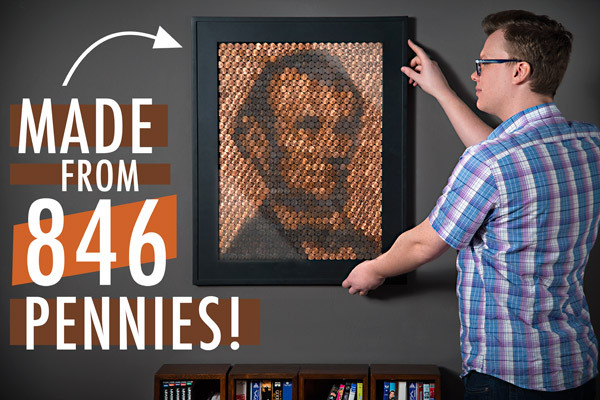 You'll need 846 pennies to complete the Lincoln Penny Portrait. After collecting your pennies, divide them into four piles: newly minted, circulated, antique, and old as Lincoln. Finally, follow the poster template and glue each penny atop the correct position. 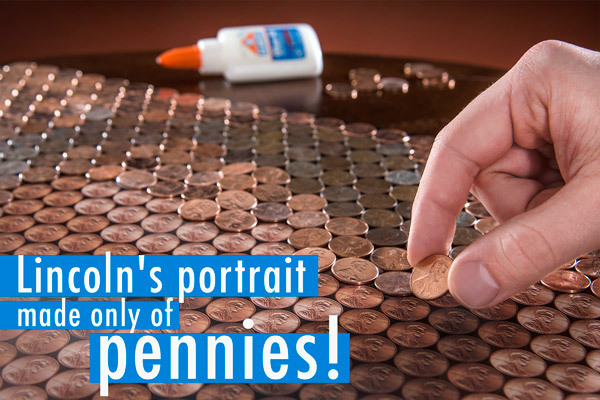 After finding and sorting your pennies, it will take approximately 5-8 hours to complete your Penny Portrait. We made two at Vat19 and found it fun and relaxing. The end result looks amazing, too! Turn a pile of loose change into a stunning and sparkling portrait of Honest Abe. The Lincoln Penny Portrait includes everything you need to get started. Well, you'll have to find your own pennies, but that's half the fun! 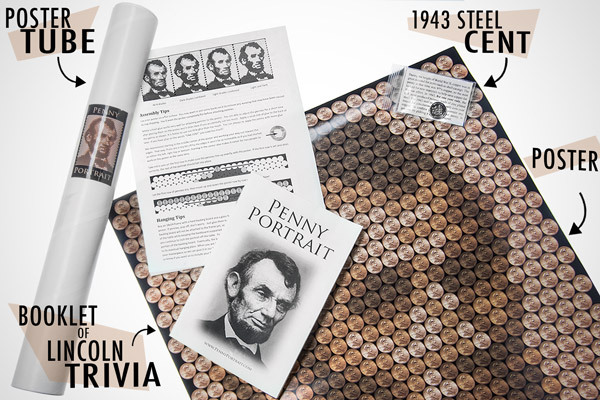 Packaged in a standard poster tube, the set includes a 12-page booklet featuring Lincoln trivia, a penny collecting guide, and simple at-home chemistry experiments featuring pennies. You'll also receive detailed instructions, the poster template, and a 1943 steel cent (while supplies last). This unique penny was only produced for one year to conserve copper for the war effort. a trivia booklet, and a 1943 souvenir steel cent (while supplies last). Question: How many of each shade of penny do I need? Answer: Sounds like you want to start collecting before your order arrives (hint, hint! ), so here is the breakdown: 349 shiny new, 112 lightly used, 97 well used, and 288 old as dirt pennies. Question: Where am I going to find all these pennies? Answer: The number of pennies required (846) may sound like a lot, but you'll be surprised at how many you can collect around the house and from friends and family. Another obvious source is your local bank. Additionally, we recommend paying for more items with cash and collecting pennies from your change. Question: Will I have a hard time finding "old as dirt" pennies? Answer: We were surprised at how many grimy pennies we received from our bank. However, there are inexpensive chemical treatments you can use to darken pennies. Some techniques are listed in the Penny Portrait's included instructions and others can be found online. Question: What if I can't find shiny new pennies? Answer: You should have a lot of luck obtaining newer pennies from your bank and stores that deal in cash like grocery stores and gas stations. However, it's quite easy to shine a penny to a bright, beautiful luster using some vinegar, salt, and baking soda. Of course, there are commercially available metal cleaners that work quickly and make even the dullest penny shine like a lighthouse. Question: I'm super laze. Can I just frame the poster without gluing pennies to it? Answer: Absolutely. The poster is quite beautiful in its own right. Question: How long will it take to make? Answer: After you've collected and sorted your pennies, it will take one person approximately 5-8 hours to complete. Question: What if I can't find 4 shades of pennies? Answer: Don't worry! The included instructions contain tips and techniques for finding and sorting pennies. The bottom line is to sort your pennies as best you can and not to worry if all of the pennies in each group match perfectly. The template still produces an impressive result even if you only sorted your pennies into "light" and "dark" categories. Question: How heavy is it? Do I need a special frame? Answer: The completed poster will weigh between 4 and 5 lbs (approximately 2.1 kg). Any decent-quality poster frame (avoid the ones made from four removable strips of plastic) can easily handle the Penny Portrait. Question: What if I had 14,833 pennies, what would that portrait look like? Answer: Thanks for asking! Check out the video below for an answer. Check out our 9-foot-tall Penny Portrait!